In-depth information on select components. Veins provides a comprehensive suite of IVC-specific models that can serve as a modular framework for simulating applications. Each model is contained in one or more of what OMNeT++ terms a module, which can be instantiated in a running simulation to provide required functionality. How to use each module is documented in the module itself in the form of doxygen comments. This can be transformed into API documentation by clicking Project > Generate NED Documentation... in the IDE, or from the command line, by running make doxy. To start reading the module documenation, open doc/index.html in your browser. This gives you the most up-to-date form of documentation specific to your version of Veins. This page gives a brief overview of some modules that are either central to the functionality of Veins, not yet contained in the standard distribution, or that require more extensive documentation, in particular pictures or videos. For accurate modeling of physical layer effects, especially for modelling and working with the distribution of transmit power over time and space, Veins relies on functionality provided by MiXiM, which has been integrated into Veins. Veins instantiates one network node per vehicle driving in SUMO. This task is handled by the TraCIScenarioManagerLaunchd module: it connects to a TraCI server (SUMO or sumo-launchd) and subscribes to events like vehicle creation and movement. For each vehicle created in SUMO, it instantiates one OMNeT++ Compound Module in the OMNeT++ simulation. This module is assumed to contain a mobility submodule of type TraCIMobility. At regular intervals it will use this module to advance the simulation in SUMO and update the node's mobility information (such as position, speed, and direction) based on the behavior of the vehicle. For quick tests, the TraCIMobility module also includes functionality to stop a vehicle at a predefined point in time (configured via its accidentStart, and accidentDuration parameters). Application modules can use the TraCICommandInterface class and related classes, conveniently accessible from TraCIMobility, to interact with the running simulation. The following example shows how to make a vehicle aware of slow traffic on a road called Second Street, potentially causing it to change its route to avoid this road. Some of the other vehicle related commands are setSpeed or setParking. Similar methods are available for the whole simulation (e.g., addVehicle, addPolygon), roads (getMeanSpeed), individual lanes (getShape), traffic lights (setProgram), polygons (setShape), points of interest, junctions, routes, vehicle types, or the graphical user interface. How to use these modules is demonstrated in the source code of the Veins tutorial example. Again, a list of all 80+ available methods can be found in TraCICommandInterface.h or the autogenerated module documentation. Veins includes an optimized physical layer implementation that can perform short-circuit evaluation of loss models for tasks like determining if receive power is above a certain threshold, thus speeding up simulations by up to an order of magnitude. Please refer to our publication for a detailed description of the model itself, including a thorough description and an evaluation. How to use this module is demonstrated in the source code of the Veins tutorial example. Veins includes a model of 802.11 that is tailored to use in vehicular networks, particularly IEEE 802.11p. This includes QoS channel access conforming to EDCA (that is, 4 queues with different access categories) and accurately captures frame timing, modulation and coding, and channel models. Veins also includes higher layer models of the DSRC/WAVE stack for channel hopping according to the standard (i.e., switching between CCH and SCH, that is, control channel and service channel), if this is desired. It further includes Wave Short Message (WSM) handling, and periodic beaconing, e.g., for sending WAVE service announcements, BSMs, or CAMs. Please refer to our publications for a detailed description of the model itself, including a thorough description and an evaluation. How to use these modules is demonstrated in the source code of the Veins tutorial example. A simulation model of the Japanese ARIB T109 standard for ITS in the 700 MHz band has recently been completed. It models both physical layer characteristics and medium access characteristics of the standard's unique combination of TDMA and CSMA/CA. The MAC layer consists of two different implementations distinguishing between RSUs (base stations) and vehicles (mobile stations). Both share a common abstract base class which contains functionality utilized in both implementations. The MAC layer combines the CSMA/CA functionalitiy from IEEE 802.11p MAC and the IVC-RVC layer from ARIB T109 which utilizes the TDMA scheme. The model is available on a separate branch of Veins (see the link below), which is only compatible with OMNeT++ 5. An example simulation is included as a separate ini file and can be executed, e.g., by running ./run -u Tkenv -f arib.ini in examples/veins. Path loss models are central to accurately modeling information propagation in a vehicular network. An often made, but wrong, assumption is that all signals propagate in close to free space conditions. In fact, particularly on linear unobstructed stretches of roads, any transmission experiences (depending on the distance) either constructive or destructive interference with its own ground reflection. Yet, the often-cited simplified Two-Ray ground model only captures the fact that (for the physics of vehicular networks), path loss increases for distances over approximately 900 meters. Veins therefore includes a Two-Ray Interference model which actually manages to capture ground reflection effects, as illustrated below. 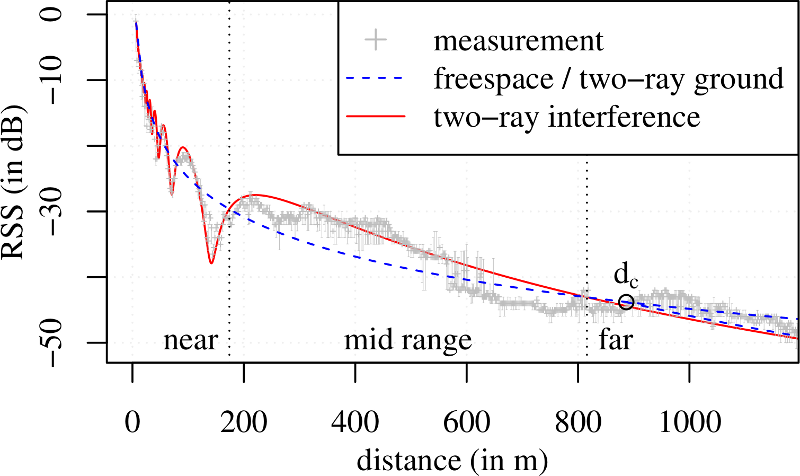 This leads to quite different areas of good signal reception (left: two ray ground, right: two ray interference), as illustrated below in a top-down view. The model can be activated by including an appropriate AnalogueModel statement in config.xml, e.g., as follows. 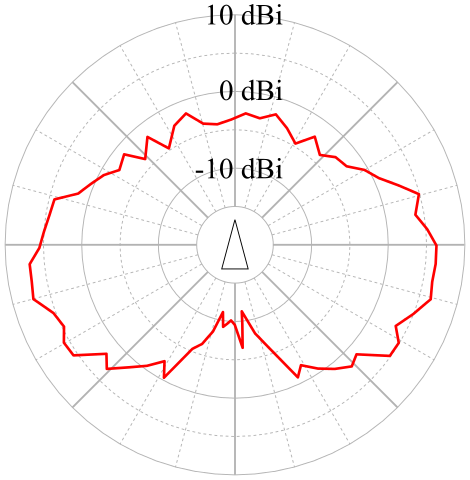 Radio transmissions are heavily impacted by signal shadowing effects. Accurately capturing this is particularly important in vehicular networks operating in suburban and urban environments, where buildings block radio propagation. 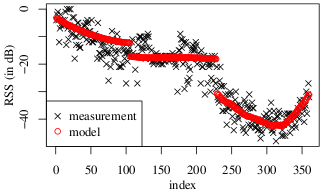 Veins includes a simple obstacle shadowing model that has been calibrated and validated against real world measurements, as illustrated below. 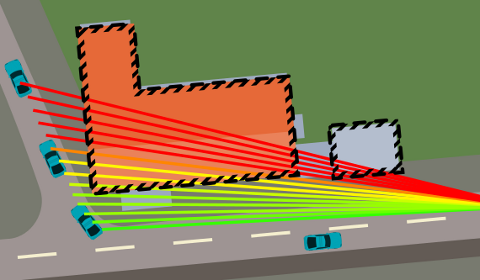 This model will accurately capture the effect that large buildings will block transmissions and weak transmissions are blocked by as little as a small wall, while strong transmissions are only slightly hindered by the presence of buildings in the line of sight, as illustrated in the sample screencast below. To view this video, download it either as ogg/theora, as webm/vp8, or as mp4/avc. The model can be activated by adding an ObstacleControl module to the simulation and including an appropriate SimpleObstacleShadowing statement in config.xml, e.g., as follows. Aside from the ObstacleControl module offering the possibility to manually add obstacles to the simulation, the TraCIScenarioManagerLaunchd will automatically detect the presence of an ObstacleControl module and automatically instantiate one obstacle per polygon of type building in SUMO. A simulation model of radio shadowing effects caused by other vehicles has recently been completed. The model is available on a separate branch of Veins (see the link below), which is only compatible with OMNeT++ 5. A simulation model that captures angle-dependent gains of antennas has recently been completed. It includes parameters for different types of real-world antenna patterns, depending on antenna type, mounting point, and roof topology. An antenna pattern can be configured by setting a physical layer's antenna parameter to an XML statement configuring the type of antenna, along with type-dependent parameters. If no antenna pattern is specified, the physical layer defaults to 0 dBi gain isotropic. At the moment, only one antenna pattern type, SampledAntenna1D, is implemented. 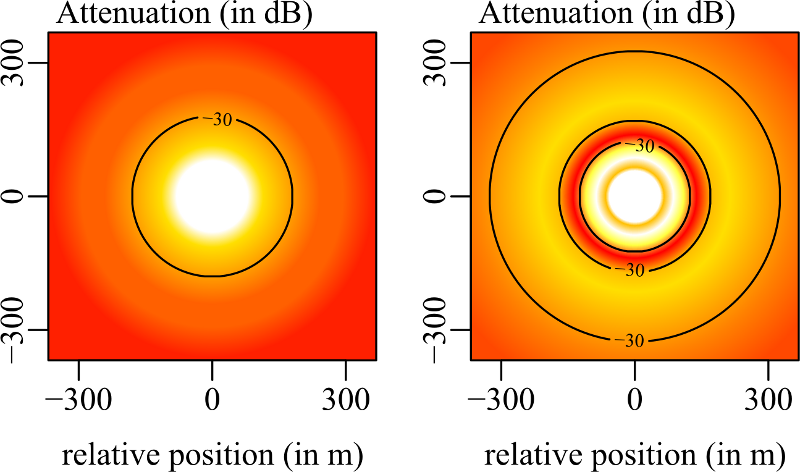 It defines an antenna pattern using a single parameter, samples, which stores a series of gain samples, taken at equidistant intervals from 0 degress, going clockwise. This antenna also takes optional random-offsets and random-rotation parameters to add a random gain offset (in dBi), as well as a random rotation offset (in degrees) to each antenna. The following is an example XML statement configuring such an antenna using very coarse (four) gain samples (+2.0 dBi to the front of the car, +1.1 dBi to the right of the car, -4.0 dBi to the back of the car, +0.9 dBi to the left of the car). This XML statement also applies a random +/- 1 dBi gain to each antenna, as well rotating the whole antenna pattern by a random +/- 1 degree. The model is included since Veins 4.5. Veins_INET is a subproject included with Veins, which allows using Veins as a mobility model in INET 3.4.0. The subproject can be imported into the OMNeT++ IDE by importing the subprojects/veins_inet folder into the workspace (or by selecting the Search for nested projects when importing Veins). An example simulation in the examples/veins_inet subdirectory of the project illustrates how Veins_INET is used: Wireless nodes representing cars can inherit from the standard INET WirelessHost, using a regular INET network card, e.g., of type Ieee80211MgmtAdhoc along with a full TCP/IP stack. Each car uses a mobility module of type VeinsInetMobility to track its position. To configure the network stack of cars entering a simulation, an additional HostAutoConfigurator module needs to be included with each car. A global module, VeinsInetManager, creates and manages cars in the simulation. This subproject is included since Veins 4.5. Veins LTE is an extension which allows Veins to serve as a unified Open Source framework for the simulation of heterogeneous vehicular networks using, for example, IEEE 802.11p DSRC, Wi-Fi, and LTE. SimuLTE provides the means of simulating cellular networks using LTE. Veins LTE is available as a separate download from the following website. Please refer to the following publication for a detailed description of the Veins LTE extension. Veins VLC enables the simulation of Visible Light Communication (VLC) in Veins. By means of this, realistic simulation of heterogeneous vehicular networks consisting of Vehicular VLC (V-VLC) and IEEE 802.11p DSRC becomes possible. Veins VLC is available as a separate download from the following website. Please refer to the following publication for a detailed description of the Veins VLC extension. Plexe is an extension of Veins which permits the realistic simulation of platooning (i.e., automated car-following) systems. It features realistic vehicle dynamics and several cruise control models, permitting the analysis of control systems, large-scale and mixed scenario, as well as networking protocols and cooperative maneuvers. Plexe is available as a separate download from the following website. Please refer to the following publication for a detailed description of the Plexe extension. Artery is an extension of Veins which enables V2X simulations based on ETSI ITS-G5 protocols like GeoNetworking and BTP. Single vehicles can be equipped with multiple ITS-G5 services through Artery's middleware, which also provides common Facilities for these services. The closely related ArteryLTE is an extension of Veins LTE (see above) that also includes backend functionality. Artery and ArteryLTE are available as separate downloads from the following website. Please refer to the following publication for a detailed description of the Artery extension. PREXT is a unified and extensible framework that simulate pseudonym change schemes (i.e. privacy schemes) in VANET. It supports seven privacy schemes of different approaches including silent period, context-based and mix-zone and can be easily extended to include more schemes. It includes adversary modules that can eavesdrop vehicle messages and track their movements. This adversary is used in measuring the gained privacy in terms of several popular metrics such as entropy, traceability and pseudonym usage statistics. PREXT is available as a separate download from the following website. Please refer to the following publication for a detailed description of the PREXT extension. F²MD provides a complete solution for real time simulation and evaluation of a MisBehavior Detection (MBD) system. It extends Veins with a large panel of MBD, evaluation, and other general Cooperative Intelligent Transport Systems (C-ITS) modules. One of the main characteristics of F²MD is its modularity. The architecture is organized in several functional levels: input data, local detection, local visual output, report data output and global detection. According to the misbehavior evaluation level, the complexity of the scenario, the attacks and the detection method may be chosen. Additionally, F²MD is extensible. Besides the implemented MBD mechanisms and attacks, it offers the possibility to extend the framework with additional modules through the existing API. A key characteristic of our framework is its integration with non-simulated modules such as external Machine Learning modules for advanced MBD and external packet reporting logging. F²MD is available as a separate download from the following website. Please refer to the following publication for a detailed description of the F²MD extension. A complete list of all available modules as well as full API documentation is available from the downloaded Veins source bundle as documented above.